This is an article by American writer Max Prince, who is currently living in the UK and studying for his masters degree in auto journalism at Coventry University. He fondly remembers his favorite Mazda MX-5 Miata, and how his best friend murdered it. 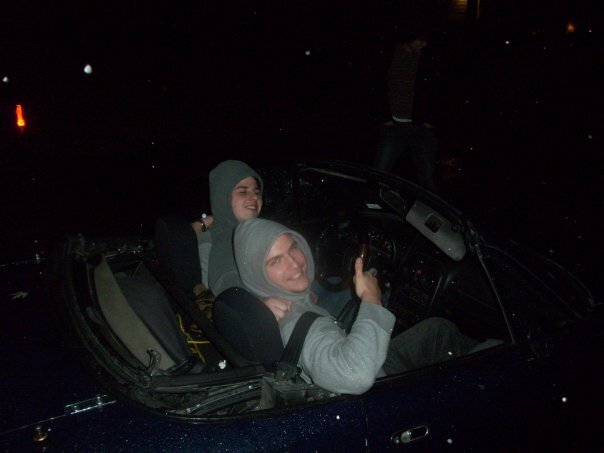 A while back, my friend and college roommate John spent two years trying to kill a Japanese roadster. He owned a turbocharged black 2002 Subaru Impreza sedan, but had been bitten by the rear-wheel drive bug (after taking my BMW M3 for a jaunt) and purchased an early-90’s Mazda MX-5 Miata, which spent most of its time being flogged like an insolent American in Singapore. It was John’s ruckus-mobile – the ‘I give up’, elastic waistband sweatpants of motor vehicles. Wearing a woefully thin coat of sun-beaten green paint, its suspension was modified with Koni shocks (which he blew jumping railroad tracks) and lowering springs, along with some elementary power-adders and a host of ‘quirky’ qualities. To begin with, it had an air horn. Not like the cool, scare-girls-jogging air horn; a creepy, feminine one. My guess is the previous owner was a Gacy-esque birthday clown who used it to lure unsuspecting children into his basement. The seats were worn through, the tires perpetually bald and, to add insult to injury, it only ran on three cylinders. 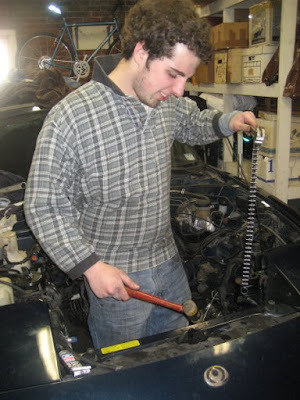 John did everything he could to abuse this poor car, hoping to fully detonate the factory engine as to justify swapping out its meager 1.8-liter four-banger in favor of something more virile. But, alas, he had no luck. That little MX-5 just took it, day in and day out. I remember him once getting annoyed by the oil light and begrudgingly funneling a few quarts of used 10W-30 into the reservoir until the warning lamp went off. ‘Finally,’ he murmured as the Miata sputtered to life, the three remaining functional cylinders panting under the stress of recycled motor oil. One spring afternoon, John and I were driving the Mazda to get lunch when it began pouring down rain…inside the car. Apparently, his impatience had inspired a habit of retracting the convertible top (by hand) while traveling at highway speeds. This, of course, had torn the stitches, letting Mother Earth into our cabin, unsolicited. Not to worry. Roaring in three-cylinder gloriousness, we slid into a small parking lot (miraculously, the parking brake never failed) and John sprinted across the asphalt into a nearby store. He emerged minutes later with a staple gun and a roll of super-absorbent, As-Seen-On-TV shammy towels. Four fabric cuts and several hundred staples later, we were dryer than nuns on a Sunday. I remember another time soon after the exhaust incident when the factory MX-5 alternator failed. A friend of ours had owned a slew of Mazda RX-7 sports coupes (as those people usually do) and a garage packed with spare, leftover parts. ‘Whatever, it’s all Mazda,’ John said. He pop-started the car about eighty times en route to the garage in order to keep it running. When he arrived, however, the reality of cross-chassis incompatibility kicked in. Not to be discouraged, he (somehow) retrofitted the Wankel rotary alternator to his MX-5 using wire strippers, metal washers and several sticks of used gum. Believe it or not, it ran under that configuration for several months. It was even crashed into a curb at one point. John had gone out on the town and had a few too many Budweisers, but compelled by the liquid bravado he’d taken to a blonde and wanted to bring her back to his house. Realizing he was far too inebriated to drive, he insisted she sit on his lap while our friend Thomas drove them home. Caught up in the moment with the top down, John demanded that Thomas do a few donuts at the upcoming roundabout. Only one problem: Thomas was a terrible driver. You can see imagine how that one ended. Still, smashed bumper and all, the MX-5 kept chugging. So how did that doleful MX-5 go out? Well, one afternoon I got a call from John. He sounded disappointed and almost solemn – by his tone I was worried someone had died. Somehow, someway, the MX-5 had spawned its own unique ecosystem and a hoard of spiders hatched underneath the floor mats and burrowed into the carpet. Air horns, exhaust poisoning, front-end collisions, ill-fitting engine parts, burnouts, stunt jump, a torn top and twenty-five percent compression loss – John and the MX-5 could bear it all. But not spiders; John hated spiders. His attitude towards any type of arachnid made the Texas Border Control look like a welcoming party. So, what’s the only thing that can kill a first-generation Mazda MX-5 roadster? Spiders – hundreds and thousands of baby spiders.